Weekend Inspiration – The Mix – Modern Meets The 16th Century. 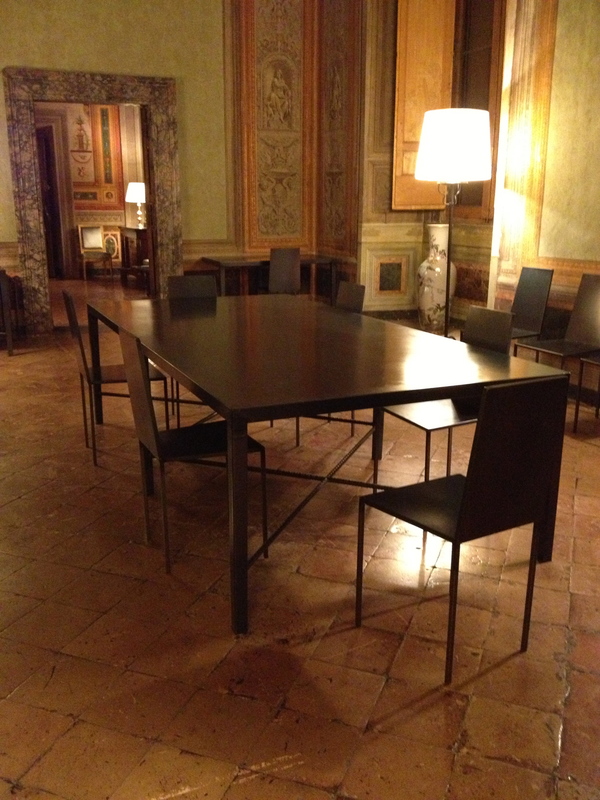 In December, I attended the AWAR holiday cocktail party at Palazzo Farnese. The construction of the Palazzo started in 1515 and it has been the home of the French Embassy since 1874. I’ve been inside the building before to vote (I have dual citizenship, American and French) and went to an exhibit they held a few years ago. However, this time there was a tour from the Ambassador himself. I had a blast that night with my friend Gillian. AWAR raised money for charity, we saw amazing art and architecture, and we had a chance to drink Champagne. One of the highlights for me was walking into various rooms by myself to study the interiors. I’m still shocked they let us take pictures (a big no-no at the American Embassy. You have to turn in your cellphones and cameras at security). “The Mix” is important. It’s also difficult to do well. A room with furnishings from a mix of eras gives off a different energy than a room where every single piece of furniture, all the vignettes, art, etc. etc. are from the exact same time period and/or store. When the mix is on point, it’s so exciting. I was surprised when I stepped into this room and saw the modern iron table and chairs. I think a traditional table from that period with very ornate detailing and decked out with ivory would’ve been too much. Instead this table compliments the room. You really notice the drop dead gorgeous proportions, the floors, the walls, everything. Most conference rooms are zzzzzzzz. This one is a stunner. Buon weekend and cin cin to mixing it up. Next Next post: Weekend Inspiration – Nathan Turner Gets Us In The Mood.